Having tools to develop my Self, as a spiritual being and as a form of self-therapy, are among the reasons I love practicing witchcraft and Hinduism. Both traditions serve my desire for theosis, or becoming a god, or achieving enlightenment. One necessary ability in this journey is being able to see clearly. Tantric Hinduism does not encourage complete renunciation of the world, rather embracing the world and also seeing it clearly is its complex call to humans. Seeing clearly, particularly seeing one’s Self clearly, can be a very sobering experience. I’d like to think that the power, self-confidence, and other strengths I’ve developed over the last few years of my practice are the most visible aspects of myself. But I’m not convinced that’s true, or that it’s important. As I pray to Kali Ma to “slay the fears that limit my spirit and dance upon the grave of my iniquities,” She gleefully gives me what I ask for. So my fears are laid before me and my iniquities spread out for all (or at least some very important people near me) to see. I am still – still – sorting through the rubble of my relationship issues. In some of the situations I am not at ‘fault’ and in others I am most definitely at fault, but the lowest common denominator in all of it is…. me. There are certain areas of my life in which I cannot be trusted to make good judgment calls. There are times when I act out of scarcity and those times are when I screw things up, bad. My Lady Kali lays this all before me. Again and again and again. I asked to slay my fears and dance on my iniquities, therefore I must see them. And oh, it is humbling. In fact, it is so humbling as to feel humiliating, and I grieve. I sat before my altar this weekend and wept. I have feelings of shame, but it is my shame. None of the gods I work with now will have anything to do with shame; it’s not them putting shame on me. Instead, the gods, particularly of Hinduism, bear a profound compassion. They answer our prayers not out of spite, or to show us how flawed we are so that we can grovel for their grace, but so that we can see clearly and heal. The truth really will set us free. 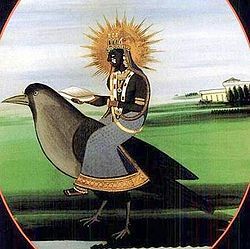 I’ve been reading recently of Dhumavati, the goddess of widows and those with nothing left to lose. Her name means ‘Smoky One,’ for like smoke she is unattached to anything, she is barely seen, she is able to go wherever she wills, as no boundary can keep her out. She is withered and dirty, a crone. She seems a little insane since she has no ‘function’ and therefore needs not keep to any rules. She has nothing, is nothing, and can offer nothing. But she is full of compassion for those who grieve. She is a bestower of boons. She brings comfort; She knows what it is like to lose it all. I realize I’ve had experiences with Dhumavati at a few other points in my life. She is powerful and not to be trifled with. In fact, she is considered inauspicious; married people and those with children are unwise to court her. I can understand: as a parent, and pregnant to boot, there are losses I would rather not know anything about. But I feel her again. There is a great deal of grief and loss that I don’t know what to do with, nor do I know how to stop making the same mistakes. So I petition her, placate her with offerings, and ask for her wisdom and comfort. Dhumavati’s main lesson is to ‘let go.’ At the core of life is the brutal reality that we only think we’re in control of our lives. But if we take one step back we might see just how little control we have. We can let go. Often letting go creates more freedom and very little destruction. Sometimes letting go means the house of cards collapses and we have to see that we were clinging to an illusion. That is painful, but also freeing. Seeing clearly is freedom. This song has been running through my head. Appropriate and so, so good. Enjoy. This entry was posted in Uncategorized and tagged Dhumavati, Hinduism, Kali, my heart, prayer. Bookmark the permalink.